Thank you for posting this! I know that you took a bit to figure out what it would look like and it is beautiful (can a gravestone be beautiful?!?). Love you guys and miss that little blue eyed baby soooooooo much!!! I love the visual in my head of Timmy running with Jesus. He's mighty speedy! As much as you can love a memorial, I do. Brings tears to my eyes. Love you guys. Thanks for sharing! Such a reminder that he is running with Jesus now. This is beautiful. Thank you for posting this! 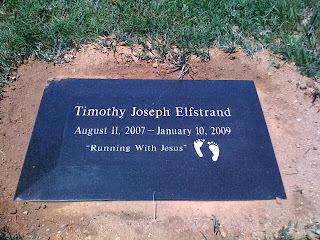 It's a wonderful reminder of where Timmy really is...not in the ground, but running with Jesus!